Salonwear’s sleeveless coat is one of the most elegant and professional salon apparel that is specially designed to provide comfort and better mobility for your salon and spa clients. If you’re looking for a spa or salon sleeveless coat that is not only functional but also trendy, then look no further! Sleeveless jacket by Salonwear is the right product for you and your clients. A salon coat is a basic requisite for anyone who’s in the spa and salon business. Our women’s sleeveless jacket is mid-length, with no sleeves and a mandarin collar. The snap-up front allows it to be worn with ease. 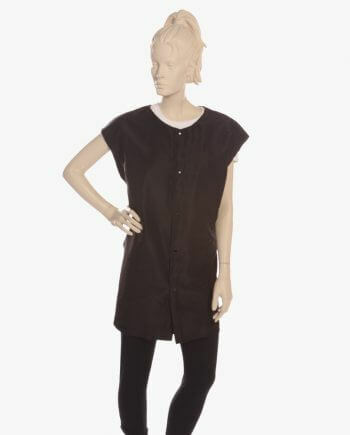 The black sleeveless jacket is designed to be airy and increase movement. Salonwear’s sleeveless coat is one of the best salon coats available in the market. In addition to the coat, we also offer sleeveless vests with rhinestone zipper, sleeveless vests and tunic tops. Salonwear’s sleeveless jackets for ladies are made with lightweight silkara iridescent fabric that ensures that your clients are comfortable while availing services at your spa or salon. The best feature of this fabric is that it shields your clients from any chemical or stain spillage that may occur during salon services. This striking salon wear is available in a daring black color. Our black sleeveless jacket is an all-time favorite for all our clients. The material used in our products is of top quality. We believe in providing only the best quality products that are not only durable but also contemporary. Our beauty salon uniforms are easy to use, trendy and comfortable. Another prominent feature that Salonwear offers to clients is customization of spa and salon apparel and accessories. You can choose to personalize your spa and salon apparel with your brand’s unique logo. Stocking such apparel in your spa or salon would instill a sense of unity and respectability among your staff and team members. Salonwear uses two top quality customization techniques: screen printing and embroidery. These services will help to achieve distinctive customizations that will help your salon and spa stand out from the rest. This leads to increased client recall value and brand awareness. This drives repeated business and overall growth of your brand. Our cosmetology jacket personalized with logo and custom embroidered jackets are sure to impress your clients! What makes Salonwear’s Beauty Salon Uniforms Different? A family business, Salonwear has been a renowned leader in the spa and salon apparel and accessories industry in the USA for the last 31 years. Our years of success have earned us the reputation of a trustworthy name. We are always creating state-of-the-art and innovative products that are classy and highly durable. We have proudly retained a large pool of loyal customers. With our hard work and outstanding client servicing, our Salonwear family is ever growing.